Holdfast: Nations At War | Holdfast: NaW on Steam. Play before early access! Holdfast: NaW on Steam. Play before early access! The smell of black powder leaves an acrid taste in your mouth. The enemy are so close now you can see patterned lace on their uniforms. You hear and feel the men beside you matching your movements, directed by the shouted orders. Another volley. Too late to run. Can you stand? 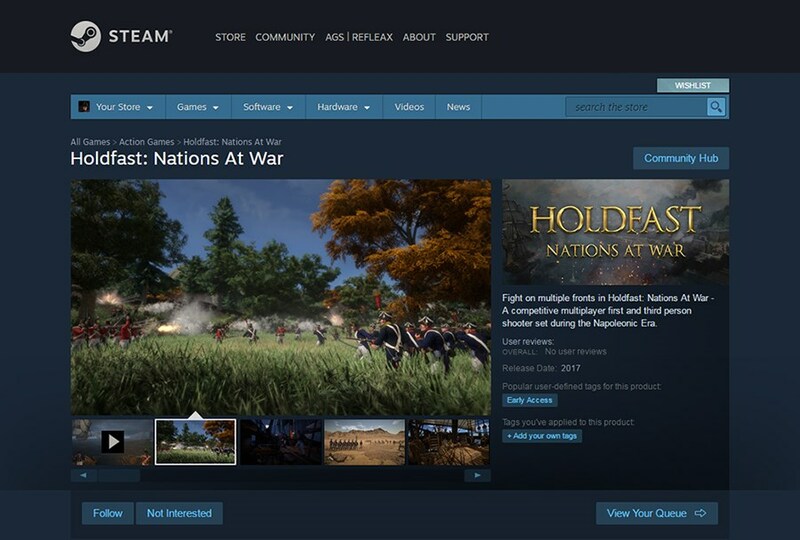 Holdfast: Nations at War is now visible on the Steam store. While you cannot purchase it as of yet, being on the store means two things to you. The first is that much of the work required to integrate the game into the Steam family has been completed and therefore we are that much closer to an Early Access release. The second is that it now opens up Steam to be another platform for both discussion and the release of further news. You’re more than welcome to give us a follow and add us to your wishlist. Your very own chance to play Holdfast: Nations At War before Early Access! We will be hosting both testing and promotional events before our release into Early Access this year. To do this we need players and therefore we will be handing out a number of beta keys on our social media. Be sure to like our Facebook page and give us a follow on Twitter so you don’t miss this opportunity! Start spreading the word around because when we host the giveaway, you will also have to involve your friends. One of our most common questions is the price. We are now in a position to announce that Holdfast: NaW will be 19.99 EUR when it is out on Early Access. We’re working as hard as humanly possible to bring Holdfast: Nations At War into your hands. We look forward to seeing you on the battlefield!